Tap for more Xinjiang maps. Xinjiang Province has been important in Chinese history as their Silk Road gateway to the West. It was the westernmost territory of several big empires. 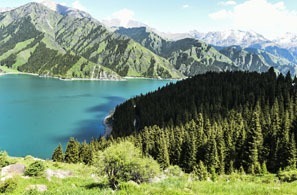 If you want to visit a naturally beautiful province, steeped in Central Asian culture, Xinjiang is where to go in China. Xinjiang is famed for its stark vast deserts and high mountain natural areas. For tourists, there are many natural, cultural, and historical places to go. The province is a huge territory that takes up about one sixth of China. Xinjiang borders with Gansu Province on the east, Qinghai Province, and Tibet on the southeast side. Mongolia, Kazakhstan, Kyrgyzstan, Tajikistan, Afghanistan, Pakistan and India border it. On the northern tip, there is a short border with Russia. The province measures 1,664,900 square kilometers. It is bigger than the size of two states of Texas. The third lowest area on the planet is in the Turpan Depression that is altitude -154 meters (-505 feet). The highest mountain is K2 that is the second tallest mountain on the planet at 8,611 meters (28,251 feet). Xinjiang has several of the world&apos;s highest mountains in the Himalayan Plateau. Xinjiang has the biggest, driest and lowest deserts in the country. The deserts are huge. The 16th biggest desert in the world is the Taklamakan Desert that extends southwards and westwards from Turpan. It is so dry that sand dunes cover 85% of it. Part of the Gobi desert is in northeastern Xinjiang. The population of Xinjiang Province in 2018 was about 25 million, but the population is growing quickly since there is an influx of Chinese from the rest of China. More than 40 percent of the population may still be Uyghur, but some Uyghurs have been moving to other provinces for work and education, and the inward migration of Han Chinese is heavy. There are about 6.5% Kazaks, about 4% Hui, and several other minorities. Urumqi holds the record for being a large city furthest from any ocean. 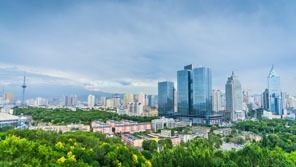 Urumqi is the capital city with an estimated 3,600,000 people in 2018. It was once near a northern Silk Road route, but not the main one that went southwest from Turpan. Only during the Qing Dynasty era did a town start to develop at the present site. In the 20th century after WWII, Urumqi developed rapidly as an industrial city. The area around it has important mineral resources and in 1955, oil production began north of Urumqi. Now, the oil field is one of China&apos;s biggest. Agriculture in the area is also a big industry. There has been a migration of Chinese from other areas. From the year 2000 to 2010, the population of the city grew by 1 million people to total about 3 million. Now, about 74 percent of the city is Han Chinese. But there are enough Uyghur people living there that it is a common language in the markets and streets, especially in the areas tourists tend to go. Turpan is a Uyghur town famed for being on the Silk Road with ancient ruins. It is near the Turpan Depression and the Flaming Mountains. Kashgar is the second biggest city with about half a million people, but the Kashgar Prefecture region has about 4 million people. It is near the border of Kyrgyzstan. It is a Silk Road city and has a population that is about 90 percent Uyghur and other minorities. Hetian is also called Hotan. It is a city of about 350,000 in a majority Uyghur region in southwestern Xinjiang. At the Jiaohe Ruins and in the Turpan area the weather is predictably dry and sunny. Xinjiang has diverse climates. Parts of Xinjiang have a temperate continental climate, the high mountains have alpine climate, and the deserts are arid or semiarid. So you&apos;ll experience quite different weather depending on where you go. The Taklamakan Desert has weather extremes. During hot summer days, the temperatures can reach 40 degrees Celsius (100 °F), but at night, the temperatures can drop to freezing. The Taklamakan Desert is in the rain shadow of the Himalaya mountain range, and cold streams of wind sometimes descend so that the temperature drops drastically. Fuyun County had a national record cold night of -50 °C (-58 °F). Turpan has the national record for the highest temperature of 49.6 °C (121 °F). The hottest month in Turpan is July during which the average high temperature is about 33 °C (91 °F). Only about 10 mm (0.4") of precipitation falls in the center of the Taklamakan Desert in a year! Turpan on the northern edge of the desert only gets 5 mm (0.2 inches) more annually. 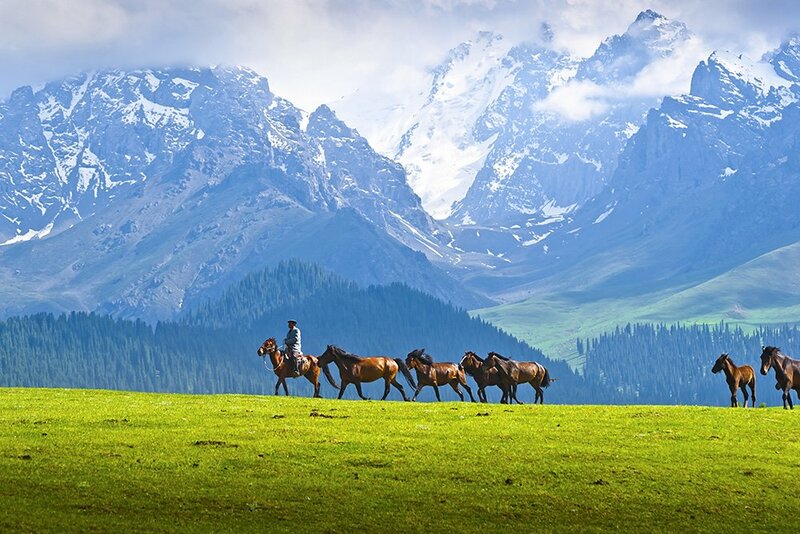 Xinjiang has been important historically as the route between East and West since the Gansu Corridor, a long deep valley through high mountain ranges on both sides, connects the Yellow River Basin to Xijiang&apos;s western border. The area has been important for trade and travel since prehistoric times. Xinjiang was once the westernmost territory of several empires and where the Silk Road crossed into Central Asia. It is were trade caravans, armies, and missionaries crossed. Prehistoric times: Xinjiang once had a fairly advanced civilization of Caucasians. Mummies were found in the Xiaohe Tombs near the far western border of Xinjiang and in other places. They show that 3,000 and 4,000 years ago, Caucasians lived in Xinjiang. DNA testing of certain mummies confirmed they were European. They had advanced European style Bronze-age clothing and artifacts. The Han Dynasty (206 BC – 220 AD) initiated trade with western countries about 100 BC. Turpan became a military Han military outpost and AN oasis stop for the Silk Road trade. Traders followed the base of the long ridge of the Flaming Mountains that goes east to west along the northern edge of the Turpan Basin. 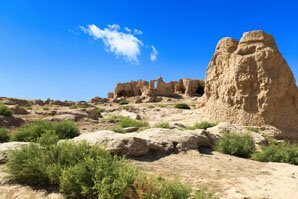 During the Han era, a large fortress city called Gaochang was built along the trade route about 30 kilometers or about 20 miles west of modern Turpan. It was multi-ethnic and multi-religious. The Bezeklik Caves was a religious site that showed paintings of both Caucasian and Mongoloid Buddhists. A Christian church was found outside the Gaochang walls. Jiaohe was another large fortress city that was built about the same time on an islet in the middle of a river about 11 kilometers straight east of modern Turpan. The tall eroded islet is about 1,650 meters in length and three hundred meters wide at its widest point. About 650 AD, the Tang Dynasty (618–907) conquered the area. Then the Tang were attacked by Tibet and lost much territory, and at about the same time, Uyghur people took control of northern Xinjiang around 842 AD. During the time of the Yuan Empire (1279–1368) when the Mongols controlled Central Asia, Marco Polo followed the Silk Road and braved the fierce desert dust storms and faced death to reach the courts of Kublai Khan. In the 17th century, the Mongolian Dzungars established an empire over much of the region. But then the Qing Dynasty exterminated them and brought in people from other areas to resettle the area. 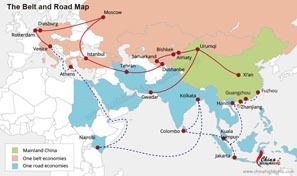 Now, Kashgar and other border areas are being developed rapidly to service the new Eurasian trade and travel that China is promoting. Xinjiang is now noted for its agriculture. The main products are cotton, vegetable oil, vegetables and fruit. Xinjiang fruit and nuts are famed in China. 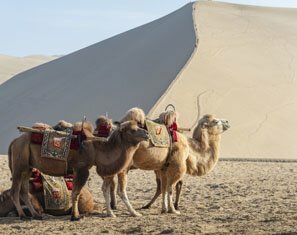 For more information about the Silk Road and its present development, see Why China&apos;s Silk Road Is So Significant — 10 Reasons that Changed the World. 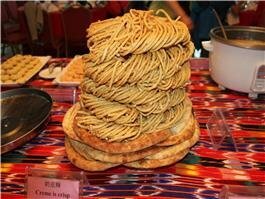 Uyghur cuisine is noted for being tasty and inexpensive all over China where Uyghur people have opened restaurants. In Xinjiang, you&apos;ll find more authentic, meaty meals such as roasted meats, diary products, breads, pastries and fruitcakes made with a lot of nuts and fruits. Meals: Typical authentic Xinjiang meals include a lot of meat such as mutton, beef, and chicken. Islamic rules forbid alcohol and pork. A breakfast might include melons, fruit jam, and milk tea. Nang, a flat Uyghur flat bread like Indian naan is commonly eaten with meals. Xinjiang Province has a variety of cultural and natural attractions. The cities are an interesting mix, and there are large forested mountain chains for adventurous hiking, camping, and visiting with ethnic people. For great mountain scenery, tens of thousands of tourists visit the Tianshan Mountains that is a long chain that cuts east and west across the province south of Urumqi. Tourists like to hike and stay in yurts in the Nanshan region of the mountains that is about two hours south of Urumqi. Another place for hiking and yurt stays is around scenic Heavenly Lake. See our Xinjiang Hiking Guide. 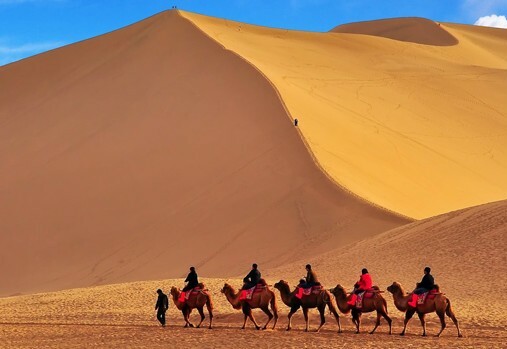 Some tourists travel by train, and others travel by tour bus or road to go to the old Silk Road cities such as Kashgar, Turpan, Urumqi, Dunhuang, and Xi&apos;an. See Silk Road Travel Tips. The transportation infrastructure is developing since Xinjiang is a developing province and transport hub for the New Silk Road. There is a bullet train to Urumqi from Xi&apos;an, but most tourists will want to travel by plane. 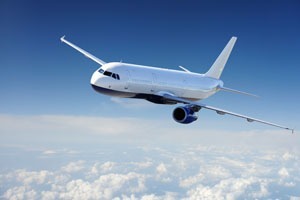 The only international airport is Urumqi International Airport. Kashgar has a domestic airport with direct flights between the two cities. Highway infrastructure is being built rapidly, but it includes 7 national highways and 60 provincial highways. Urumqi is the central highway hub. High-speed trains make Xi&apos;an and Urumqi 11 hours apart! For sightseeing, seeing the scenery, and ease of travel between the Silk Road locations further east, we recommend that you take bullet trains. But bullet train travel is as yet undeveloped in Xinjiang. There is one D class high speed train between Lanzhou and Urumqi that takes about 11 hours. Regular Z or T class (high speed) train travel between Xi&apos;an and Urumqi takes between 25 and 32 hours. These are bed trains where you can sleep in bunks or cabins. Between Lanzhou and Urumqi, Z or T trains take 16 to 20 hours to make the distance. Between Urumqi and Kashgar, fast T class bed trains ply the route in about 18 hours. 1. Bring warm clothing even in hot summer since the temperature can differ greatly between day and night in some places on the route. 2. Bring shoes suitable for walking. 3. It is advisable to use sunscreen. You may also want to bring a moisturizer as the air is very dry in the desert areas. For hotels, there is clear division between the peak travel period from June to October when the weather is better and the cold low season when Xinjiang is more inhospitable. But to save money and to avoid crowds, consider planning a trip in the colder months. Remember that about half the population is Muslim. Follow your guides&apos; advice when visiting with a local family or entering into a mosque. 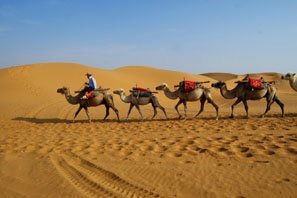 See Traveling Along China&apos;s Silk Road — 10 Facts You Should Know for more tips. Interest in Xinjiang is rising now since more and more tourists are doing trans Eurasia Silk Road trips. China Highlights can help facilitate your China leg and help your journey onwards to Central Asia and the rest of China. Though distances to popular places outside Xinjiang are vast, the bullet train makes travel more feasible. Popular tourist areas just east of Xinjiang include those in Gansu Province. Lanzhou is a large important city on the Yellow River, capital of Gansu Province. Zhangye&apos;s "rainbow mountains" are more colorful than America&apos;s painted desert. 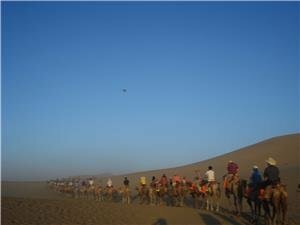 You can ride like a Silk Road trader in Dunhuang. Along the Great Silk Road — This 12-Day trip from Xi&apos;an to Kashgar stops at Zhangye, Dunhuang, Turpan, and Urumqi. 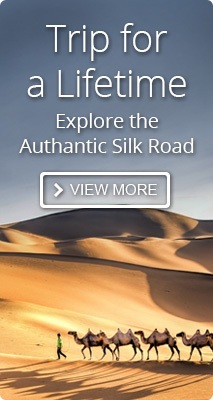 Our customizable Silk Road Adventure Tour will help shape your own trip of the Silk Road. For something significantly different, we would be glad to tailor-make a Silk Road tour for you.